SRI International's Small Vision System is a Developer Kit for stereo applications. 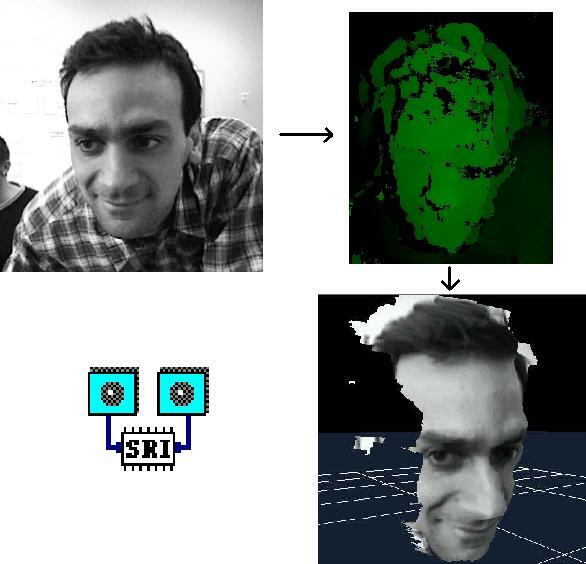 The SVS libraries can calibrate a stereo head, rectify the images to account for distortion, perform stereo correlation to compute a range image, and display the range image in OpenGL 3D form. SVS has support for the stereo heads provided by Videre Design. It can also work with images provided in memory. SVS is the most efficient, high-quality stereo range software available for standard or embedded PCs. NOTE: SVS is bundled at no extra cost, with all Videre Design digital stereo heads! Excellent range resolution and accuracy, using imagery from Videre Design cameras. Range is interpolated to 1/16 pixel, and texture and consistency filters remove unreliable results. Simple, fast, accurate stereo head calibration using a printable planar target. You can change lenses, change baseline, even verge your cameras, and still calibrate them accurately. Lens distortion, all internal camera parameters, and external camera parameters are computed. Easy-to-use C++ library API for MS Windows or Linux makes programming applications simple. Cross-platform display with the FLTK GUI and OpenGL 3D windows let you display results immediately. SVS has an interface to MatLab, so stereo images and disparity results can be sent directly to MatLab for further analysis. The XVision2 system, developed by Greg Hager at Johns Hopkins University, has an interface to SVS. XVision2 concentrates on realtime segmentation and tracking in video images. SVS comes bundled with Videre Design digital stereo heads. It is also available as a software system for a modest licensing fee. Digital framegrabber* for acquiring live images, if using a stereo camera. 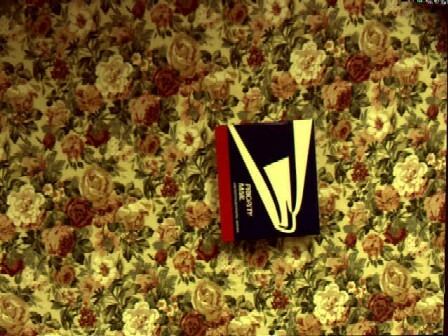 This 640x480 color image, taken with a MEGA-D stereo head, shows the fine detail of the imagery. Below, the SVS system has converted the stereo pair into an accurate 3D point cloud. 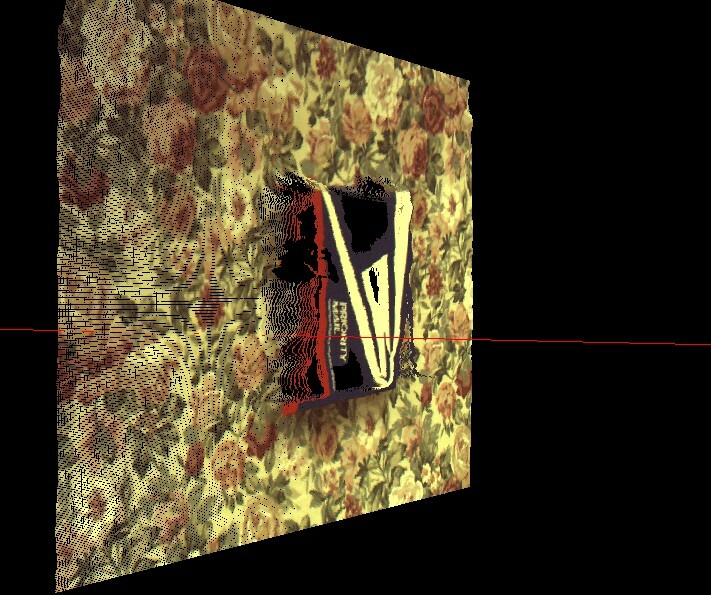 Click on the bottom image to view an animation of the point cloud. The red ray is the camera line-of-sight. SVS was run in standard mode, with no post-processing of the disparity or 3D image, other than the standard texture and L/R filters. To fully appreciate the impact of full-motion stereo, you can download these quicktime movies, which show several people moving in a corridor -- click on the images to show the movie. The left-hand movie is the video image, the right is the stereo disparity image. The frame size is 320 x 240, with 24 disparities, at 15 fps. XVision2 is the newest version of the XVision system developed by Greg Hager, now at Johns Hopkins University. It is an open-source vision system, concentrating on realtime segmentation and tracking algorithms for video data. The new version incorporates and interface to SVS, enlarging its scope with realtime stereo input. XVision2 is a convenient way to experiment with new algorithms and applications using stereo. XVision2 also has a MatLab interface to SVS data, so that the power of MatLab analysis can be brought to bear on your stereo data.